Ottawa, September 2018: C-COM Satellite Systems Inc., the world’s leading provider of commercial grade auto-acquire mobile satellite antenna systems, has signed a contract with one of its long-standing integrator partners pursuant to which the partner is permitted to order up to US$2,000,000 worth of C-COM’s products over a 5-year period. AltegroSky is a leading VSAT satellite communication operator in Russia with subsidiaries that include satellite operators CJSC "Rais Telecom", CJSC "SETTELECOM", CJSC "Moscow Teleport" and system integrator LLC Altegro Engineering. The company has been reselling for more than a decade and has created unique integrated solutions in many vertical markets, including Emergency Services (police, fire, ambulance), Oil & Gas exploration, Broadcasting, and Mobile Banking for rural Russian communities. “The multi-year contract valued at US$2 million covers our extensive line of iNetVu® mobile antenna systems,” said Drew Klein, Director of International Business Development for C-COM. “This agreement shows long-term interest from one of our most active integration partners in the region operating in demanding environments to deliver the highest quality product to their customers,” Klein continued. “Cooperation with such a respected international company as C-COM Satellite Systems is strategically important for GC AltegroSky,” said Tatyana Shumaeva, Head of Marketing for Altegrosky. 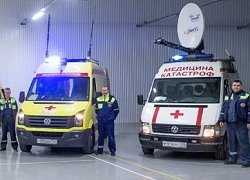 “The concluded new supply agreement, that meets the growing demand for mobile satellite communications solutions, is the best confirmation of the quality and relevance of C-COM’s iNetVu® mobile antenna systems in Russia,” continued Shumaeva. There are no minimum commitments on the part of AltegroSky under the supply agreement and some of the terms of sale of products under the agreement shall be determined at the time of order.